CallSource works with both major and niche industries. As a content writer, I make sure to stay up-to-date with these industry groups to provide relevant and compelling content to you, our readers. In Incisal Edge magazine’s second annual “32 Most Influential People In Dentistry,” Dr. Farran was named number 5. Incisal Edge gave him the title of “The Connector,” which seems very relevant as Dr. Farran does connect many people together both in the dental community and a bit outside of it. All of that being said, I’ve found Howard to be a very useful as well as entertaining person to follow on LinkedIn and other social media platforms to gain new insights into the dental industry and its trends. 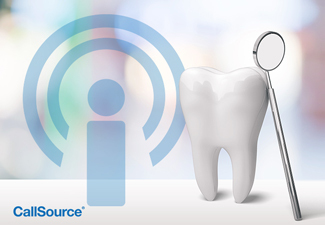 I know that dental professionals are very busy people – and that’s why if you don’t already have the chance to follow Dr. Farran and listen to his podcast (which I highly recommend you do), I’ve gathered up some great tidbits from a few of his podcasts that I have shared with our dental audience here at CallSource. Below is a round-up of great facts and expert advice from Dr. Howard Farran and his podcast guests. In this episode, Howard and Leonard focus on the importance of online reviews for dentists. In this episode, Howard talks social marketing with Shannon Gilpin, owner of a social media marketing agency, about how dentists can use social media marketing to their advantage. In this episode, Howard talks to marketing expert Ken Newhouse on how to earn more patients with effective marketing strategies. Hopefully just a few of these tidbits from some of Howard Farran’s podcast have been helpful to you – and you should definitely check in to listen on a more regular basis when you can. Who else do you follow in the dental industry that you think your peers can benefit from? Let us know in the comments below!